How you grip the club has a huge affect on the golf shots you hit. But don’t let anyone tell you that there is one golf grip that everyone should use, because that is simply not true. You’ve just got to look at professional golfers to see this. For example, Ben Hogan used a weak grip to help combat a hook problem. Nick Faldo uses a neutral grip. Then John Daly uses a strong golf grip. Now you’ve probably heard that the weakness/strength of your golf grip is related to where the V’s of your hands are pointing. But I’ve got a much better way to check your grip and find out what works best for you. First of all, get a semi permanent felt tip pin and draw circles about 1 cm above your top hand’s knuckles. So for a right handed golfer you would do this on your left hand. For a left handed golfer you would do this on your right hand. Now simply practice taking your grip and see what your grip feels like when you can see 1 knuckle, then 2 knuckles, then 3 knuckles on your top hand. Also do this exercise with your feet together. By doing this you’ll always have a reference position that you can easily repeat. By the way, a 1 knuckle grip is considered a weak golf grip, a 2 knuckle grip is considered a neutral golf grip, and a 3 knuckle grip is considered a strong golf grip. After you’ve setup with each grip then hit balls with each of these golf grips. Incidentally when placing your bottom hand on the grip simply let it go along with what the top hand is doing. And do this so that the groove in the middle of your bottom hand fit’s snugly into your top hands thumb. Now if you struggle in hitting one particular shot, i.e. a slice or hook, here’s some advice that will help you. If you slice the ball a lot you should tend towards a stronger golf grip, e.g. 3 to 4 knuckles showing on the top hand. And conversely if you hook the ball a lot you should move towards a weaker grip, e.g. 1-2 knuckles showing. But the bottom line is to experiment. Once you’ve got a good golf grip that works well for you always check it regularly to make sure you’re doing the same thing. 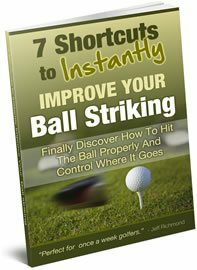 Because over time your golf grip can easily become stronger or weaker without you noticing. Also one final thought. Have a system of setting up so you check your golf grip strength as part of your pre-shot routine. 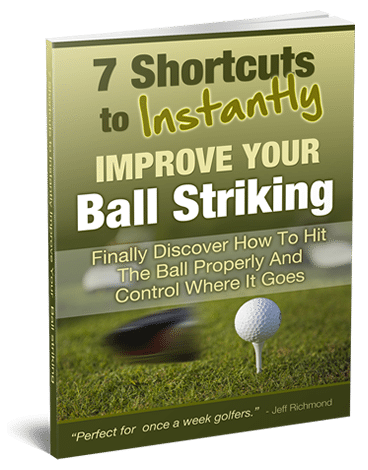 Doing this will help to create greater consistency in your game on an ongoing basis.